When Oakland designer and builder Stephen Schoup's firm, building Lab inc, grew too big for his old backyard workshop, he thought long and hard on how to increase his workspace in a sustainable way. After much deliberation, he settled on an L-shaped shipping container office space where he could incorporate many of the leftover materials and supplies he had laying around. 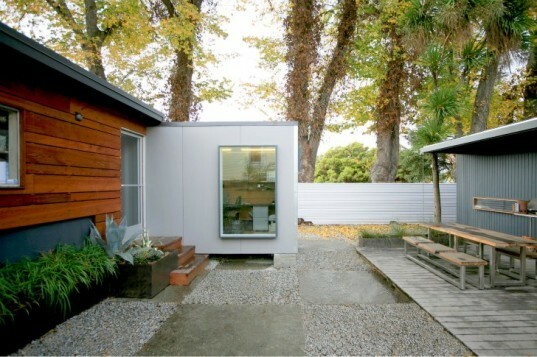 The newly created backyard office balances the warehouse-style home and creates a charming courtyard in between. Schoup brought in two shipping containers and arranged them together in an L-shape to create a permeable courtyard which opened the house up to the surrounding views and the sun. He and his wife planted a row of bamboo along the eastern edge of the property to give the space definition and to block the views towards the neighbor’s house. The containers were placed on pier foundations, a far simpler and less resource intensive process than full foundations. 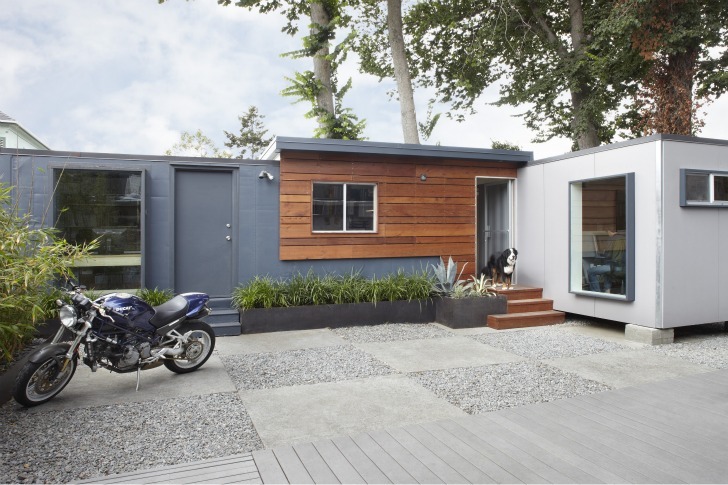 The exterior of the containers were insulated and clad in cement board siding, salvaged lumber from deconstruction and leftover redwood siding provide a warmer look, and were further painted to match the exterior of the house. Inside, the work space is heated with hydronic floors that is supplied by a rooftop solar hot water system. Energy efficient lighting and windows provide lighting for the interior, which was finished with Homasote (recycled newspaper) panels instead of drywall. Schoup made good use of leftover and extra materials he had laying around from other jobs, rather than buying brand new materials. Finally the floors were finished off with sustainably harvested cork flooring. After the backyard conversion and addition, Schoup had more than enough space for his firm and employees and improved the lot for a more cohesive look. Previously Schoup had already remodeled his home into a beautiful two bedroom residence for his family. Schoups container work space can also be found in a new book by Michael Litchfield called, In-Laws, Outlaws and Granny Flats by Taunton Press. i am in love with shipping container shelters. it would be great to have an idea of a price on something like this. Schoup brought in two shipping containers and placed them together in an L-shape to create a permeable courtyard, which opened up the space up to the surrounding views and the sun. He and his wife planted a row of bamboo along the eastern edge of the property to give the space definition and block the views towards their neighbor's house. The containers were placed on pier foundations, a far simpler and less resource-intensive process as compared with standard foundation. The exterior of the containers were insulated and clad in cement board siding, salvaged lumber from deconstruction and leftover redwood siding to create a warm look. The structure was also painted to match the exterior of the house. Energy efficient lighting and windows provide lighting for the interior, which was finished with Homasote (recycled newspaper) panels instead of drywall. Schoup made good use of leftover and extra materials he had laying around from other jobs, rather than buying brand new materials. The floors were finished off with sustainably harvested cork flooring. The new container office creates a charming courtyard with permeable paving materials. The large lot and home/work space is now complete. A view off the back deck into the home's kitchen. Previously Schoup had already remodeled his home into a beautiful two bedroom residence for his family. The large, bright, white kitchen space. The master bedroom with built in storage and a raised platform bed. A layout of the home and the backyard office.